One day, your printer could hook up directly to the Internet. Need to deliver a report to far-flung corners of the globe? Push a button on your printer, and you'll be able to ship it directly to other faraway printers, which will produce finished copies of your document. Planning to take the missus out for dinner at that out-of-the-way chichi Italian eatery? Your phone will beam directions directly to your printer. Wondering if the New York papers have any special insight on last night's Yankee game? Your printer will spit out copies of the Daily News and the Post in the time it takes you to make a cup of coffee. Hell, your printer might even make that coffee for you. One day, that all could happen. Just not today. Still, that's not stopping Hewlett-Packard from getting the ball rolling toward an expanded role for printers. The printer manufacturer held a press conference last week to unveil new alliances with Internet-based service companies and to trumpet what it sees as the future of imaging: the printer as an information appliance. "Most people think of printers as peripherals... beige boxes that sit at the back of their desk," said Hewlett-Packard CEO Carly Fiorina. "This simple beige box is going to change your life." Or, as HP president of imaging and printing systems Carolyn Ticknor puts it, "The question now is no longer printer speed, or how many DPI, but what services do printers provide to you?" Hewlett-Packard's on to something here. Internet appliances -- slimmed-down devices that can send information to and retrieve data from the Internet -- figure to be in heavy demand over the next few years. And if Hewlett-Packard wants to provide the printers and infrastructure that allow its customers to access increased services online, more power to them. It certainly has the resources and the muscle to carry off what Fiorina and company have in mind. There's only one problem. 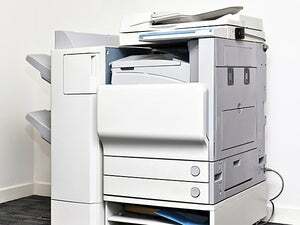 We're yet not at the point where printers will supercede the desktop -- not by a longshot. And the services that have emerged are not enough to make grandiose statements about the changing face of printers sound like anything more than hype-filled hot gas. What's more, Mac users looking to take advantage of these strategies, alliances and print appliances had best learn to cope with disappointment. Hewlett-Packard has its reasons for wanting to usher in a new era for printing. The global imaging market including hardware, supplies and services is about $70 billion today. Hewlett-Packard figures that e-services could expand the market to more than $100 billion. Projections from IDC are rosier -- the market research firm forecasts a $130 billion market by 2004. The more services printers can deliver, the more businesses and consumers will want to buy them. That's music to Hewlett-Packard's ears; the company already enjoys a leading share in the printer market. So HP executives can be forgiven for their excitement over what they call the emerging "printing e-services ecosystem." I have no idea what a printing e-services ecosystem is, either. But the boys in HP marketing probably worked late into the night to craft that particular bit of jargon, and I'm sure that if I don't use it at least once, their feelings are bound to be hurt. and FedEx, which will lets consumers print out bar-coded shipping labels using HP inkjet printers (Before the FedEx-HP partnership, labels could only be printed out on laser printers off the Internet.). A brave new world for printing? Maybe. But Mac users wouldn't know; many of the services HP and its partners have to offer aren't compatible with the Mac OS. There are two exceptions. FedEx lets you print out its shipping labels regardless of whether you use Windows or Mac OS; you just need an HP inkjet or laser printer. NewspaperDirect also offers its browser-based services across multiple platforms, though right now, it's targeting service industries such as luxury hotels. The other services are Windows-only, although Mimeo.com hopes to release a Mac version of its software in a few months. ImageTag says it also plans to be cross-platform eventually. Last week Hewlett-Packard also unveiled its $1,499 JetDirect 4000 print appliance, which streamlines network printing by hosting print queues and localizing traffic. The appliance only supports Windows 95/98, Windows NT, and Windows 2000, though it can run on a Mac in a TCP/IP network. All this nattering about missing Mac compatibility aside, the problem with Hewlett-Packard's pronouncements isn't that the company is touting a bad idea. It's a pretty good plan, as a matter of fact. But it's a matter of keeping things in perspective. Yes, printers will play an integral part in the online world, perhaps even assuming a leading role as what we demand from the Internet changes. "This strategy is not wishful thinking," HP's Ticknor says. "It's happening now." Well... sort of. Although for now, it's still the desktop that drives the bus. When I go online to print a news article or a PDF file or a map to that out-of-the-way chichi Italian eatery I mentioned earlier, sure, I'm using a printer -- a discontinued HP LaserJet 5 Si MX, as a matter of fact. But it's my Power Mac G3 that's connecting to the Internet and downloading the file and finding me those directions. The printer is just along for the ride. Will that change? Possibly. But it's important to keep things in perspective. Talk of the dawn of a new era for printing is a bit premature, hype intended more to drum up excitement among investors than to give a complete picture of what's available right now. Meaning if you want that cup of coffee, you'll have to get it yourself. Your printer is busy right now. Macworld Associate Editor PHILIP MICHAELS ( pmichaels@macworld.com ) covers the news beat for Macworld, in print and online.